Most DSLR photographers prefer the versatility of zoom rather than prime lenses, and that’s where most of the action is in the telephoto sector. 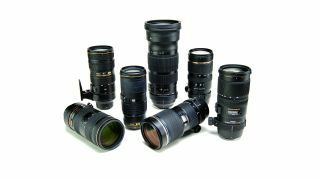 Choices range from modest zoom ranges with ‘fast’ aperture ratings to super-telephoto zooms that stretch to 500mm for comparatively mighty reach. There are actually a number of hyper-telephoto 150-600mm lenses on the market as well, but we have a separate buyer’s guide for those: the best 150-600mm lenses. You don’t always get what you pay for. Sometimes you get more. Sigma and Tamron in particular have upped their game over the last few years, and are now marketing lenses that can match or even beat own-brand Nikkors, while saving you money into the bargain. One thing to watch out for is that some of the latest lenses feature an electromagnetically controlled diaphragm. Compared with the mechanical lever traditionally used in Nikon’s F mount lens system, this enables greater consistency in aperture control, especially when shooting in high-speed continuous drive mode; the downside is that aperture control is incompatible with older Nikon bodies, including the D300s, D3000 and D5000, and you’ll only be able to shoot at the lens’s widest aperture; check out the specifications list for each of our featured lenses to see which have electromagnetic aperture control. Read on for our pick of the telephoto zooms that currently win out for price and performance. Nikon’s latest and greatest AF-S 70-200mm f/2.8 FL ED VR lens is undeniably spectacular, but this Tamron does everything pretty much as well, and for just half the price. It has an astonishingly fast autofocus system and a triple-mode optical stabilizer, with the third mode being similar to Nikon’s ‘VR Sport’ mode – this applies stabilization only during exposures, making it easier to track erratically moving objects in the viewfinder. On top of that, the Tamron’s VC (Vibration Compensation) system is a stop more effective than the Nikon’s, with class-leading 5-stop performance. The weather-sealed build quality doesn’t feel quite as robust as that of the Nikon lens, but it’s pretty close, and image quality is epic in every respect. At little more than half the weight of most 70-200mm f/2.8 lenses, the Nikon AF-S 70-200mm f/4G ED VR lightens the load for handheld shooting; even so, a tripod collar is available as an optional extra. The reduction in size and weight is thanks to the ‘slower’ aperture rating of f/4, but this still remains constant throughout the zoom range, and the zoom and focus mechanisms are both fully internal, so the physical length of the lens therefore remains fixed at all times. The VR system has a 4-stop rating, and comes complete with automatic panning detection and a switchable ‘Active’ setting that’s ideal for shooting from a vibrating platform. High-spec optics include three ED (Extra-low Dispersion) elements, one HRI (High Refractive Index) element and Nano crystal coatings, all of which help to deliver the superb image quality for which this lens is renowned. This Tamron lens matches the Nikon 70-200mm f/4 in most respects, although its maximum focal length stretches a little further. Again, it’s full-frame compatible, but gives a slightly longer effective zoom range on DX-format DSLRs, equivalent to 105-315mm in full-frame terms. The Tamron’s optical image stabilizer is similarly effective for static shots but less so for panning; it lacks a switchable ‘Active’ mode, but nevertheless works well when shooting from an idling vehicle or other non-steady platform. Image quality isn’t quite as sharp as from the Nikon lens but it’s still very impressive in all respects. The construction includes weather seals and a keep-clean fluorine coating on the front element. Squeezing a quart into a pint pot, this DX-format telephoto zoom has a retractable design, as featured in some of Nikon’s 18-55mm ‘standard’ zooms. The upshot is that it packs away to just 83mm in length and weighs a mere 300g, making it particularly well suited to travel photography. However, the weight reduction is due in part to the lens having a plastic rather than metal mounting plate – it’s certainly not one of Nikon’s most robust optics. The autofocus system is based on an ultrasonic motor, rather than being a ring-type system. This results in autofocus speeds being fairly pedestrian, and there's no full-time manual override. Even so, it’s a smart buy as a compact telephoto zoom for use with DX-format DSLRs. We were always big fans of Nikon’s AF-S 70-300mm f/4.5-5.6G IF-ED VR and this recently launched replacement is even better. It features a ‘Pulse’ stepping motor autofocus system that’s incredibly fast and essentially silent in operation, and there’s also an electromagnetically controlled diaphragm; the only catch is that both of these systems make the lens incompatible with a number of older Nikon DSLRs. The VR system is particularly effective, with 4.5-stop performance and a switchable ‘Sport VR’ mode, ideal for tracking erratically moving objects through the viewfinder. The weather-resistant construction feels robust, and the lens is a top performer in terms of handling and image quality, although some may be disappointed at the lack of a focus distance scale. Since launch, the average selling price has dropped by almost a third, making this lens much better value. It’s not the outright cheapest telephoto zoom on the market, but, considering that it has fast, whisper-quiet ring-type ultrasonic autofocus, plus highly effective optical stabilization, it’s a steal at the price. Unlike many of Tamron’s more recent, up-market lenses, it’s not weather-sealed, but the overall standard of build quality is still very good. Aided by the inclusion of both an LD (Low Dispersion) and an XLD (eXtra Low Dispersion) element, levels of sharpness and contrast are very pleasing, and colour fringing is well controlled. All in all, you can’t buy better if you’re in the market for a budget 70-300mm lens. Unlike some Nikon tele-zooms, the Tamron is compatible with FX as well as DX-format bodies, and its conventional autofocus and aperture control systems make it compatible with older DSLRs. Weighing barely more than a kilogram, this Tamron is much lighter than most 70-200mm f/2.8 lenses, but gives you twice as much telephoto reach at the long end of its zoom range – if you’ve upgraded from a DX camera with a 70-300mm lens, and are missing the 1.5x crop factor on your FX body, it can give you back some of your lost reach. The lens is sturdy and robust, despite its relatively light weight compared with the likes of Nikon’s AF-S 80-400mm VR, and incorporates weather seals. Performance benefits from super-fast autofocus, 4-stop dual-mode stabilization, and an autofocus limiter that you can use to select either the short or long section of the focusing range. Best of all, image quality is every bit as good as from Nikon’s heavier and pricier 80-400mm VR. At nearly three times the price of the Sigma and Tamron 100-400mm lenses, the Nikon 80-400mm VR probably won’t seem like great value. However, it’s really well built and, compared with the original edition of the lens, the AF-S model has a massively faster autofocus system, with auto/manual-priority AF mode options, along with much-improved VR. Even so, it lacks the Sport VR mode that’s featured in some of Nikon’s latest telephoto lenses and, even for static shots, VR is only worth about three stops. As you’d expect for a lens of this weight, it’s supplied with a tripod collar, and it delivers very good image quality. Ultimately, however, it struggles to justify its much higher selling price than the Sigma and Tamron 100-400mm zooms. A little more compact and lightweight than the competing Tamron 100-400mm lens, and rather less heavy than the Nikon 80-400mm, this ‘Contemporary’ zoom from Sigma still feels solid and sturdy. It even has a dual-mode zoom mechanism, which you can operate by twisting the conventional zoom ring or with a push-pull action of the barrel; the supplied lens hood is specially shaped for the latter option. Impressive image quality benefits from the inclusion of four SLD (Special Low Dispersion) elements and, like the much pricier Nikon 80-400mm, there are switchable auto/manual-priority AF modes. Two custom settings can be applied to tailor the autofocus and stabilization systems to your requirements, via Sigma’s optional USB dock. It’s a great lens for the money, although the lack of an optional tripod mounting ring might be a bit of an upset. Despite its reasonable asking price this Nikon lens certainly isn’t lacking in advanced features, including very fast ring-type ultrasonic autofocus, an electromagnetically controlled aperture, and a 4.5-stop stabilizer complete with Sport VR mode. It’s also unusual for this class of super-telephoto zoom in having a constant rather than variable aperture, with f/5.6 remaining available throughout the entire zoom range. Three ED (Extra-low Dispersion) elements help to boost sharpness and contrast while reducing colour fringing. The Nikon doesn’t have quite the maximum telephoto reach of competing Sigma and Tamron 150-600mm lenses, but it comes very close, and it's great value at the price.